VANCOUVER, Wash., - The American Queen Steamboat Company announces its second vessel, the 223-guest American Empress, which will make Vancouver, Wash. her home port. The largest riverboat west of the Mississippi, she will officially join the fleet&apos;s Memphis-based American Queen on April 5, 2014. In addition, the company is pleased to announce that its Pacific Northwest office will also be based in the southwest Washington city of Vancouver U.S.A., just across the Columbia River from Portland, Ore.
"We are delighted to welcome the American Empress to Vancouver U.S.A. and our unique Northwest paradise on the banks of the mighty Columbia River," shares Vancouver U.S.A.&apos;s Rosemary Arruda Cooke, Director of Sales and Destination Services. "The style and service for which the American Queen Steamboat Company is known comes as a welcome addition to the region and we are thrilled for her to call our community home." Claudette Waggoner, wife of Chairman and CEO John Waggoner, will serve as godmother and officially name the boat as part of festivities in downtown Portland on April 5. Former Secretary of Transportation Ray LaHood, longtime leader for the U.S. maritime industry and champion of U.S. river cruising expansion, has been announced as the ceremony&apos;s keynote speaker. Highlights of the festivities will include performances by local musicians, a blessing of the boat by Chinook Tribal elders with a bottle of local sparkling wine crashing against the American Empress bow. Additional participating dignitaries include the 13th Coast Guard District Commander Rear Admiral Richard T. Gromlich and Acting Maritime Administrator Paul "Chip" Jaenichen. The American Queen Steamboat Company entered into a purchase agreement of the 223-guest riverboat with the U.S. Maritime Administration (MARAD) in May 2013 and has had a team onboard preparing for her April 2014 launch on the Columbia and Snake Rivers. Formerly the Empress of the North, the American Empress will deliver opulence on a grand scale, following in the pedigree of the line&apos;s namesake riverboat American Queen, and proudly serving as the largest overnight riverboat west of the Mississippi River. She is currently undergoing final preparations for her inaugural season and sea trials with the U.S. Coast Guard are scheduled for later this month. Her maiden voyage will be a nine-day journey immersing guests in the splendor of the Columbia and Snake Rivers, departing from Vancouver U.S.A. Featured stops include some of the region&apos;s most celebrated ports including Astoria, Ore.; Stevenson, Wash.; The Dalles, Ore.; Sacajawea State Park, Wash. and finally Clarkston, Wash. Complimentary shore excursions will be available in every port and include the cultural and historical landmarks that signify the living legacy of the region&apos;s first settlers. Travelers with specific interests are encouraged to enjoy the variety of Premium Experience Excursions such as the Walla Walla Wine Trail or a journey to the volcanic crater of Mount St. Helens. Daily lectures will also be provided by the Riverlorian, an onboard history and culture expert. The American Empress was built in 2003 and operated by Majestic America Line from 2003 to 2008, sailing Alaska&apos;s Inside Passage and the Pacific Northwest. Just as the American Queen brought luxury and grandeur to river cruising America&apos;s heartland, the American Empress will do the same for the Pacific Northwest. For a full resolution image, click here. The American Queen Steamboat Company (AQSC) is the owner and operator of the U.S. flagged American Queen, the largest, most opulent riverboat in the world. Longer than a football field, towering six decks in height and laced with fanciful gingerbread trim, she is a marvel of modern engineering. Her journeys through the heartland offer a unique perspective on America&apos;s history, culture and landscape with convenient departures from some of America&apos;s most iconic river port cities including Memphis, New Orleans, Cincinnati, Louisville, Pittsburgh, St. Louis and St. Paul. 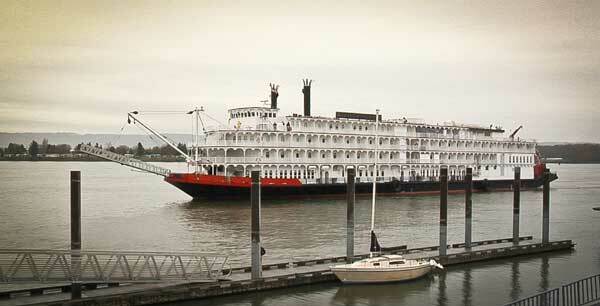 In April 2014, AQSC will begin serving the Pacific Northwest with the opulence and grandeur of the American Empress. The American Queen Steamboat Company is a proud supporter of The National Trust for Historic Preservation. For additional information and reservations, contact the American Queen Steamboat Company at 888-749-5280, visit us online at www.AQSC.com or call a professional travel agent. The Vancouver USA Regional Tourism Office is an economic development organization responsible for competitively marketing Vancouver and the surrounding area as a destination for meetings, conventions, and group and leisure travelers. Vancouver is known for its high quality of life, outdoor recreational opportunities and its historical setting as the birthplace of the Pacific Northwest. The Tourism Office also markets the area as a venue for sports events through the Vancouver USA Regional Sports Commission. The Regional Tourism Office&apos;s mission is to increase visitor spending and opportunities in Vancouver and Clark County. For more information call 360-750-1553, or visit www.VisitVancouverUSA.com.